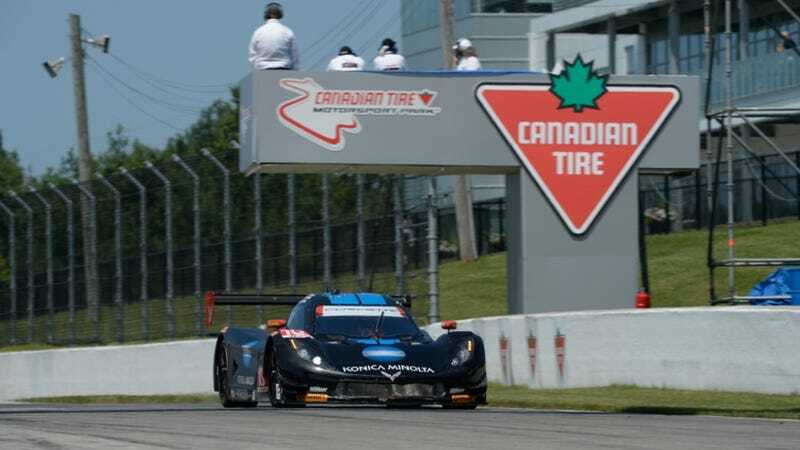 Only 0.477 seconds separated Wayne Taylor Racing from the number 31 Action Express car at today’s Tudor United SportsCar race at Canadian Tire Motorsport Park*. Here’s how one mistake made the end of the race go from an easy win for Action Express to an insane battle for the top of the podium. Action Express’ Dane Cameron had built up a sizable chunk of lead time on Jordan Taylor in the Wayne Taylor Racing car when they came in for a pit stop. The car was hard on its left rear tire, so they planned to swap the tire and splash in a bit of fuel. There was only about ten minutes left in the race, so making sure their most punished tire was fresh seemed like a safe bet. Unfortunately, the team made one fatal flaw in their last pit stop: they had trouble seating their fuel nozzle on the car to fuel. Crew members tapped the shoulder of the fuel man as a heads-up that he was taking too long, but he didn’t respond immediately. This spat out Action Express’ number 31 car right alongside Wayne Taylor Racing’s number 10 car, allowing the number 10 car to whir right past for the lead. Action Express’ car seemed to be faster, but could the Wayne Taylor Racing boys hold them off? One thing makes multi-class sportscar racing interesting for the lead battle are all the slower cars in the way. Every time Taylor caught a slower car, Cameron would get that much close. At one point in time, a PC class car held up Taylor so much that it looked like Cameron would get the pass. It didn’t happen, though, and Taylor drove like a madman to stay ahead. If there had been another lap, perhaps Cameron would have taken the win. There wasn’t, though, and despite the two cars gunning for the finish as fast as they could, Taylor was able to get there first, besting Cameron by less than half a second for the Prototype class and overall win of the weekend. The third place of the podium was no slouch, either. Ozz Negri did the final two hours of the race with no power steering, as the unit failed early on in the number 60 Michael Shank Racing P2. According to Sportscar365, he was transported to the medical center after the race to be treated for dehydration. Negri had also posted the race’s fastest lap in the P2. Who else won? The number 911 Porsche 911 dominated GTLM with a 15.525 second lead over the second place number 24 BMW Team RLL Z4 GTE. CORE Autosport took its first PC class win of the season, finishing with the same number of laps as the P-class DeltaWing. Full provisional results can be found here. Update: The broadcast commentary team remarked that Action Express’ number 31 car appeared to take on too much fuel, but several who were at the race have noted that the team actually had trouble seating the buckeye on the fuel hose on the opening for Action Express. It appeared to take a couple tries to get the fuel hose seated properly on the car, so the story has been updated above. There also wasn’t a lot of information out immediately after the race as to why Negri was transported to the medical center. An HPD press release on Trackside Online confirms that he was briefly treated for dehydration, so that has been added above.